Ultra crispy and tender fried green beans are the perfect party appetizer that packs a bold flavor punch with a satisfying crunchy texture! 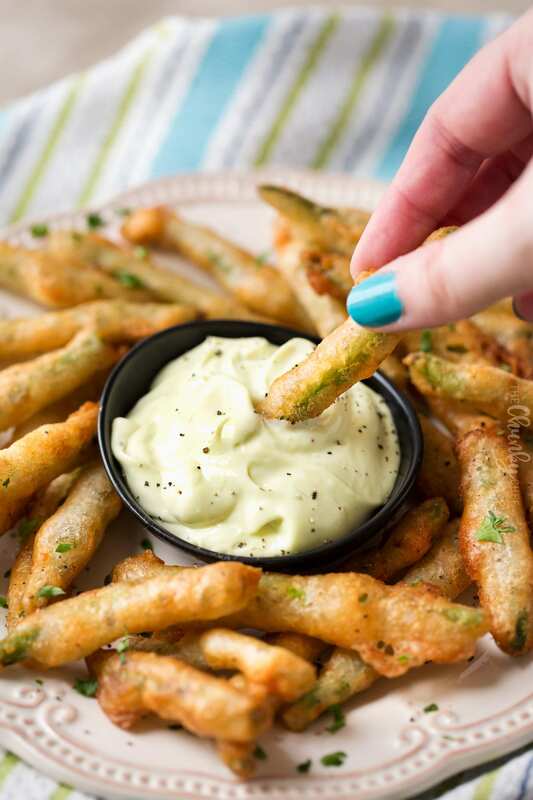 Tender green beans dipped in a homemade beer batter, then fried until crispy (yet still with a light crunchy texture), are a fantastic party appetizer or fun new spin on “fries”! 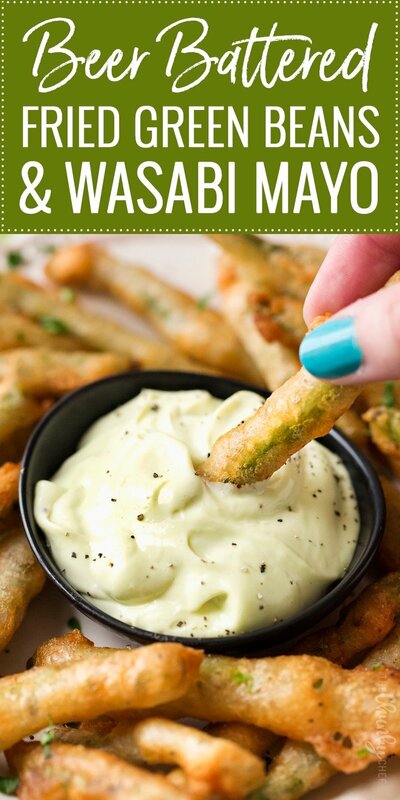 Try them with the easy wasabi mayo for a bold flavor punch, or dip them in a cool creamy ranch sauce for a more mild flavor. 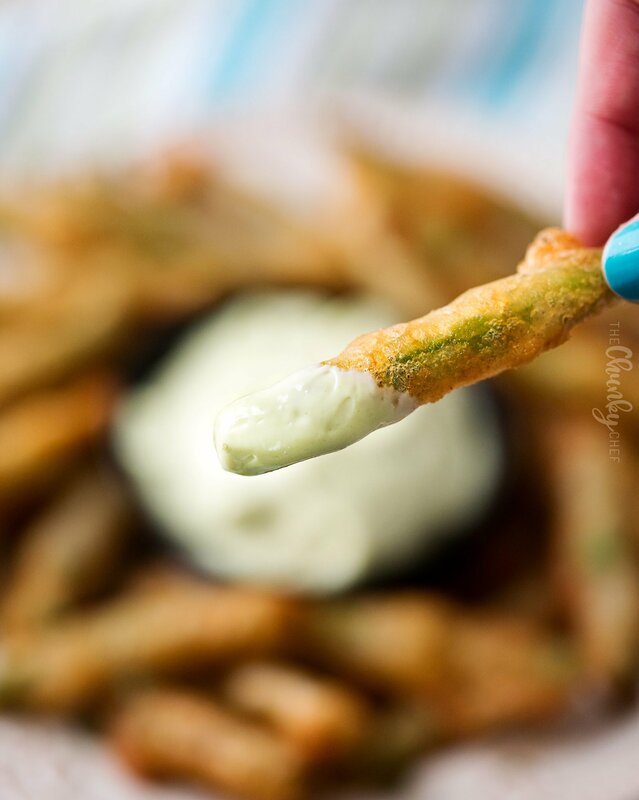 A while back, TGI Friday’s used to have an appetizer on their menu that was my favorite… fried green beans! I have no idea if it’s still on their menu or not, but now it doesn’t matter, since I can make them whenever I want! It’s not an exact copycat, but I think it tastes even better. My recipe uses an easy beer batter that lends to a super crispy and delicate textured green bean. Even if you don’t like to drink beer, you don’t want to swap it out for plain water, as the carbonation in the beer is what gives the batter such great texture and crispness. If you really need to swap the beer out, I would try a seltzer water, so it still has the carbonation. 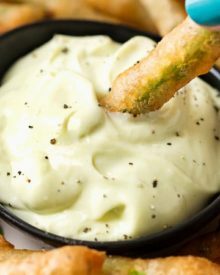 No crispy green bean is complete without something to dip it in… and this wasabi mayo is simply amazing. It’s creamy with a kick! I use a wasabi paste from my grocery store, but if you can’t find that, a wasabi mustard can usually be found in most grocery stores. If all else fails, these green beans are fantastic with a cool, creamy ranch dressing as well. Granted, this isn’t the healthiest dish. It’s certainly not going to win any awards from the American heart association lol. But as an occasional treat or indulgence, I think they’re worth it! Everything in moderation, I say. For the best texture, use fresh green beans. They cook as you fry them, so they’ll be tender, with a slight snap. If you prefer a more tender green bean, you can blanch them first, but make sure you run them under cold water (to stop the cooking process), then dry them REALLY well. Use a beer you like to drink. I usually use Guinness Blonde (which I also use for my chorizo and beef sloppy joes), but any lighter bodied beer should work. Make sure the green beans are dried really well, so the batter will stick to them. Fry the green beans at about 375 F degrees. No thermometer? No problem! Try a test green bean… if it bubbles up and slowly turns golden brown, it’s ready. Not many bubbles? The oil isn’t hot enough. Turns golden brown pretty quickly? The oil is too hot. Keep your crispy green beans actually crispy! I do this with all my fried foods, and it really works. Line a rimmed baking sheet with paper towels, then lay a wire cooling rack on top of that. As you remove a batch of fried green beans, lay them on the wire rack. The excess grease will drip away from the food, and onto the paper towels. The air between the paper towels and the wire rack makes sure all sides of the food remain crispy! You don’t have to wait until a game day party to have these fried green beans, although they’re definitely great for that. 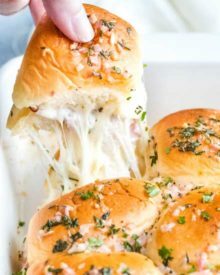 I like to serve these at other parties, or even as a fun side dish! You’ll love the crispy, yet light texture. Dutch Oven – my favorite tool to fry in! Also great for soups, breads… you name it, and at an affordable price! Rimmed Baking Sheet/Cooling Rack Combo – the perfect set-up for all types of frying! Spider Strainer – the easiest way to transfer fried foods from the hot oil… also great for pasta and veggies! Wasabi Paste – if you can’t find it in the grocery store, this is the kind I use. 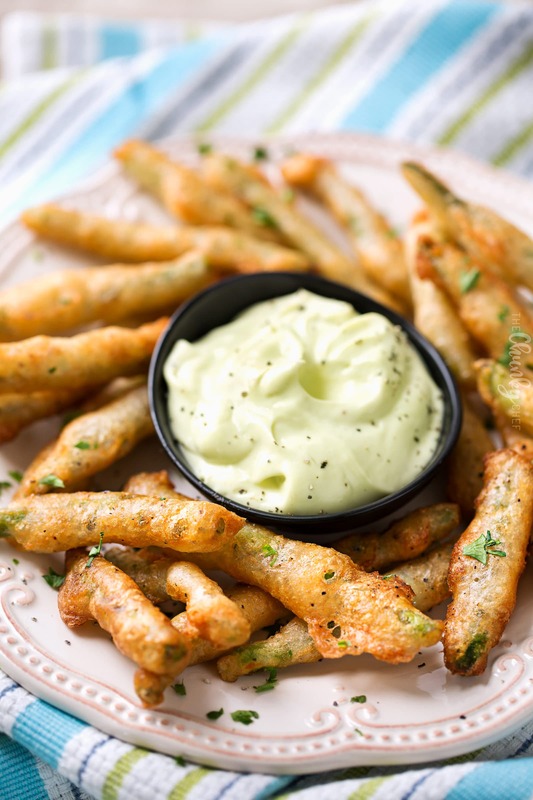 WANT TO TRY THESE FRIED GREENB BEANS? In a small bowl, mix mayo and wasabi paste until combined. Refrigerate until ready to serve. Heat 1-2 inches of oil in a large heavy bottomed pot (I use my dutch oven), over MED heat until it reaches 375 F degrees. Line a rimmed baking sheet with paper towels and top with a cooling rack. Set aside, close to your frying pot. In a mixing bowl, whisk together beer, flour, salt, pepper, garlic powder, and cayenne pepper. Dredge green beans in 1/2 cup flour, shaking off excess, then dip green beans in beer batter. Let excess batter drip off, then fry in batches, a few minutes per side, until golden brown. Remove green beans to prepared baking sheet. Repeat with remaining green beans. Oh my! This looks and sounds delicious. I will be trying this soon! I’ve never heard of this, but I know I could easily eat a dozen. YUM! 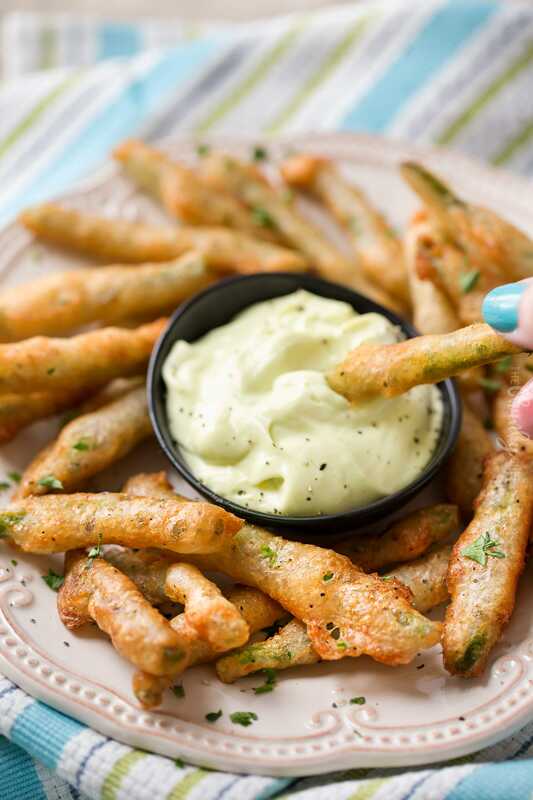 I’ve never had fried green beans, but these look so good and will have to give them a try! Can you airfry these green beans? I don’t have an air fryer, so I can’t say for certain. Pinned! 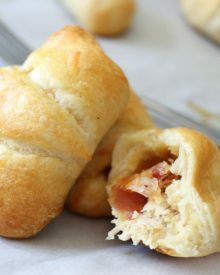 These are so happening at my next party! 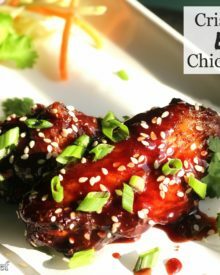 That is the perfect appetizer for our parties! Great idea to use green beans! What a tasty appetizer, and I’m all over that wasabi mayo! This will be a huge it at my house! I am also loving that dip! I’m definitely intrigued! This is a must try for me! One of my favs!! Thanks for sharing, I will definitely be making these! This is so good. It’s perfect for the coming holidays. This is the most brilliant way to enjoy green beans. It doesn’t taste and look like veggies.